= Kotoshi mo girichoko bakari! = Semete howaito dei de moto wo toranaito..
How do you celebrate Valentine’s Day in your country? People in other countries celebrate this day with their loved ones. You give sweets, flowers or other presents to your loved one and this sometimes includes family, right? Here in Japan it’s a one-way gift giving street: women to men. Yes! Women give men chocolate and other presents! This custom was started by a chocolate company about 50 years ago. Since then it has become a huge commercial event throughout Japan. There are mainly two types of motivations women have for giving chocolate to men. •命を大切にしましょう ( = Inochi wo taisetsu ni shimashou) We should respect our lives. 本命 ( = honmei) true love, the one you really love. It is also used to refer to a person who is likely to win, a favorite, a shoo-in. = Kare wa honmei no kanojo ni shika yasashiku shinai. = He is only nice to girls he really likes. = Maggie wa konkai no senkyo de honmei to mirareteiru. = Maggie is considered to be a strong favorite in the election. = Sono shou no honmei wa Maggie da. = Maggie is a shoo-in for the award. 2) Another type is chocolate that is given without any romantic feelings attached. This type of chocolate is called 義理チョコ（ = giri choco). The literal translation is “obligatory chocolate” and it’s true that this chocolate is given out of a feeling of obligation. Women usuallyc give 義理チョコ ( = giri choko) to classmates, coworkers, bosses, teachers, or clients that they are not romantically interested in. We tend to associate 「義理と人情 ( = giri to ninjyou) 」with old Yakuza ( = Japanese Mafia) movies. In the old days Yakuza were considered to be very loyal and compassionate. Legal obligations are 義務 ( = gimu). 義理 ( = giri) is more like the moral obligation you feel when you owe someone psychologically. = (O)giri de sonna koto shinaide. = Don’t do it because you feel obligated..
= Anohito ni giri ga aru node chotto kaeshite okanaito. = I owe him (because he did me a favor before) so I have to do a little something in return. I have talked about some Japanese gift-giving customs before. What do you mean you forgot!? :mad: Go check the following lessons again! Anyway, if you receive gifts, we are supposed to give something back in return. In formal cases, a proper label must be put on the お返し ( = okaeshi) the gift being given in return. If you receive a gift or gift money ( お見舞い ( = omimai) ) when you are sick, you have to return a 快気祝い( = Kaiki iwai) when you recover. It is very common to give gifts in return whenever you have an opportunity. It’s not just reserved for formal situations. So if you want to maintain good relationships with your friends, neighbors, relatives or coworkers in Japan, keep in mind that you shouldn’t always be on the receiving end of gift giving. If you do that it, people will see you in a positive light and consider you 義理堅い ( = girigatai) loyal. But of course, you don’t need to return a gift every single time you receive something. And it’s important to note that some people will feel uncomfortable if you return a gift immediately. = Kaette okizukai itadaite moushiwake arimasen deshita. 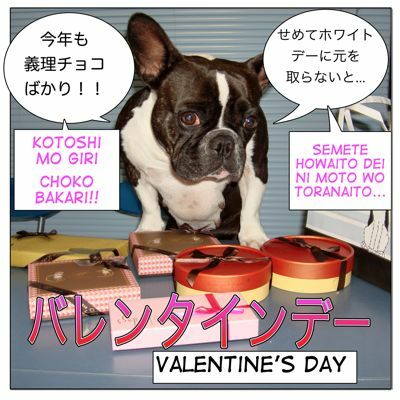 OK, back to Valentine’s Day in Japan. It is a day of LOVE but it is also a day when women can take control over men. Remember that only women are supposed to give chocolates to men. Men can’t do anything but be passive and just wait to see whether they can get chocolates or not. Many high school boys compete to see who gets the most chocolates and use this as a way to measure their popularity. Even if they know it is just 義理チョコ ( = giri choco) “obligatory chocolate”, many men still feel loved by the number of chocolates they get. At the end of January, all the department store or sweet shops start to sell fancy chocolates for Valentine’ day. 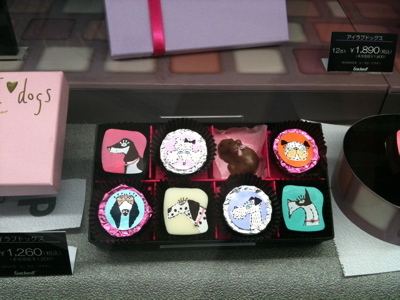 ↑ Yukari bought these chocolates (for herself!). She said every dog has a different taste. ↑ Many of chocolates are very artistic. These are Japanese traditional fans. = Taberu no ga mottainai. = They are so pretty so I don’t want to ruin them by eating them. 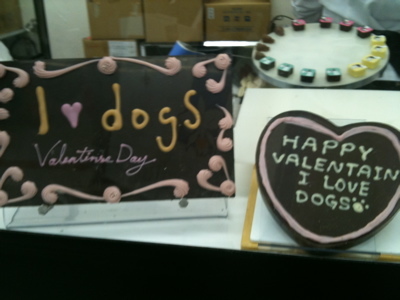 Also many girls make their own chocolates from scratch. Some girls book a nice restaurant and pay for the meal, give their sweethearts a box of chocolates with a gift. What kind of gifts do women give men besides chocolates? Many Japanese women used to give men handmade sweater or mufflers in the past but these kind of gifts are considered corny these days. According to a recent survey, the most popular gift for men is neckties. There is a trend to give their sweethearts underwear on Valentine’s Day. Men feel special to get those presents not just chocolates, the survey said. March 14th is known as ホワイトデー （ = howaito dei) White Day. As I mentioned above, Japanese respect お返し ( = okaeshi), to give something in return, culture. White Day is the day men who have received chocolates or gifts have to give gifts back to the women in return. There is an unsaid rule called 三倍返し ( = sanbai gaeshi) which means you haveto return something three times the value of the original gift you got. The standard gift for White day is sweets, such as candies, cookies and etc., but there is not a strict rule for the gifts so you can choose to give other things such as accessories, underwear or even more expensive items like watches, bags, etc. Now let’s look at today’s picture. We also say ばっかり ( = bakkari) in a casual way. = Semete howaito dei de moto wo toranaito. =　Tabehoudai de) sanzenen mo dashitan dakara ippai tabete moto wo toranakuccha. = I payed good 3,000 yen (for all you can eat) so I have to eat a lot to match what I have paid for. Cultural note: Now women have started to wonder why only men can get all these delicious chocolates….. 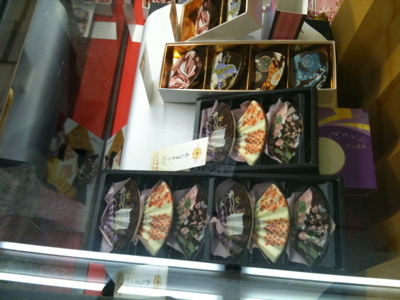 There is a new trend called, 友チョコ ( = tomochoco)“chocolates for friends”women give each other chocolate. All these could be conspiracies created by chocolate companies. But who cares! We love chocolate! = Kotoshi no barentain kara sukina onnano ko ni hone wo ageru koto ni shitara iinoni. = Why don’t we start giving bones to girls you like from this Valentine’s Day! By the way, who sent me this card?? I know this post is old, but I have a question! 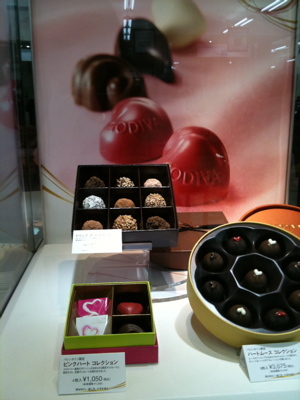 In your post, you note that Godiva is for big clients. Should it not be given to a boyfriend then? Is it too formal? What would you recommend? I said Godiva is for 本命 (the person you really like) (or big clients) so of course you can give it to your boyfriend along with other fancy chocolates. Or you can make your own chocolates. 手作りチョコ(=tezukuri choko) handmade chocolates. Ah! Okay. Thank you for explaining! Thank you very much for your time, Maggie! You’re welcome! Hope you have a sweet Valentine’s day. = Inochi wa taisetsu ni shinakute wa ikenai. = You have to respect one’s life. = The earthquake took a hevy toll of lives. Hi sensei, just dropping by with a questions. Toranakuccha, I thought the 未然形 was “nakucha”, can I write it as “nakuccha” as well, sensei? Is there a special rule for when to write and not to write it like this? You are right. Ah, they both work. Very again they are both very colloquial. Oh, I got it sensei, thank you very much. One thing that kinda shocks me about this part of japanese culture (society in general, actually) is how much importance is given to money and the cost of presents. To me, the feeling that a present carries on it is way more important than the cost of it. Regardless of how expensive, beautiful, useful, delicious, etc. a present could be, if it’s not given from the heart it’s just a hollow thing and over the years you’ll probably not even remember who gave it to you. I personally think that (at least for me) something as small as a sincere letter or a handmade thing, rather than any expensive gift, can become a real treasure. こんにちは！Orti! Thank you for your comment! Your comment was VERY refreshing. As you said sincere letter, handmade things can show more love than expensive presents. I guess people start to lose confidence and don’t know how to express one’s love, friendships or gratitude without spending money. As for me, a romantic poem or one piece of bone would work! Sensei, thanks for your reply, I hadn’t thought about lack of confidence, maybe that’s one big reason. See, I always reffered to Valentine’s Day as Singles Awareness Day. XD I wonder how you’d say that in Japanese? I remember in elementary school, we had to decorate shoe boxes and make a card for everyone to put in them (If you made them only for a few people, you wouldn’t be allowed to hand them out). I heard that on White Day, sometimes they get ribbons in Japan? Or just a rumor? コメントありがとう！I enjoyed reading it. Loved the idea of shoe boxes! It is always interesting to hear about other country’s culture. Haha! でれでれ vs ツンツン, huh? It is universal but at least Japanese girls have 友チョコ or マイチョコ so that girls have an excuse to buy ourselves chocolates and eat them. LOVED her reaction to the card HAHAHAH she ever found out who sent it? as for the US: I feel like unless if you have a significant other, Valentine’s Day can be kinda depressing (so I like the idea of tomochoco^^) cause seriously Valentine’s stuff is everywhere and it’s all about romance no giri or tomo anything, so unless if you have a significant other it’s kinda like you are being left out oh and it’s mainly guys doing things for girls, I think (here we got this whole idea of a “prince on a white horse” doing stuff for his “princess” so the girl just usually sits back and enjoys it^^) oh and gifts are usually chocolate or something else that’s sweet, roses, maybe underwear…. Yes, it is one of the few days that women can take the initiative and men just have to wait patiently for the chocolates from girls. You should come visit Japan now. You can get all kinds of chocolates from all over the world. I am a beginner in learning Japanese and I have just discovered your blog. I will be following your blog from now on diligently. Youkoso! Welcome to our blog!! I hope you can learn something here. I will make more lessons for beginners as well. Please feel free to leave questions or request anytime. Please come back here again! Mata kitene!